New Delhi /ˈnjʊ dɛli/ is the capital of India and seat of the executive, legislative, and judiciary branches of the Government of India. It is also the centre of the Government of the National Capital Territory of Delhi. New Delhi is situated within the metropolis of Delhi and is one of the eleven districts of Delhi National Capital Territory. New delhi constitutes roughly 1% of the population of delhi metropolis. With a population of 22 million in 2011, Delhi metropolitan region is the world's second most populous city and the largest city in India and also one of the largest in the world in terms of area. After Mumbai it is also the wealthiest city in India, and has the 2nd highest GDP of any city in South, West or Central Asia. Calcutta (now Kolkata) was the capital of India during the British Raj until December 1911. However, Delhi had served as the political and financial centre of several empires of ancient India and the Delhi Sultanate, most notably of the Mughal Empire from 1649 to 1857. During the early 1900s, a proposal was made to the British administration to shift the capital of the British Indian Empire (as it was officially called) from Calcutta to Delhi. Unlike Calcutta, which was located on the eastern coast of India, Delhi was located in northern India and the Government of British India felt that it would be easier to administer India from Delhi rather than from Calcutta. On 12 December 1911, during the Delhi Durbar, George V, the then Emperor of India, along with Queen Mary, his Consort, made the announcement that the capital of the Raj was to be shifted from Calcutta to Delhi, while laying the foundation stone for the Viceroy's residence in the Coronation Park, Kingsway Camp. The foundation stone of New Delhi was laid by King George V and Queen Mary at the site of Delhi Durbar of 1911 at Kingsway Camp on 15 December 1911, during their imperial visit. Large parts of New Delhi were planned by Edwin Lutyens (Sir Edwin from 1918), who first visited Delhi in 1912, and Herbert Baker (Sir Herbert from 1926), both leading 20th-century British architects. The contract was given to Sobha Singh (later Sir Sobha Singh). Construction really began after World War I and was completed by 1931. The city that was later dubbed "Lutyens' Delhi" was inaugurated in ceremonies beginning on 10 February 1931 by Lord Irwin, the Viceroy. Lutyens designed the central administrative area of the city as a testament to Britain's imperial aspirations. 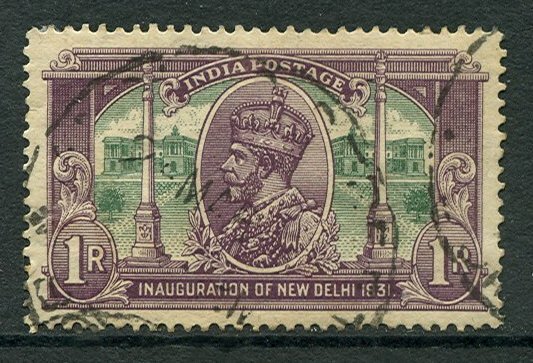 The 1931 series celebrated the inauguration of New Delhi as the seat of government. The one rupee stamp shows George V with the "Secretariat Building" and Dominion Columns. Soon Lutyens started considering other places. Indeed, the Delhi Town Planning Committee, set up to plan the new imperial capital, with George Swinton as chairman and John A. Brodie and Lutyens as members, submitted reports for both North and South sites. However, it was rejected by the Viceroy when the cost of acquiring the necessary properties was found to be too high. The central axis of New Delhi, which today faces east at India Gate, was previously meant to be a north-south axis linking the Viceroy's House at one end with Paharganj at the other. During the project's early years, many tourists believed it was a gate from Earth to Heaven itself. Eventually, owing to space constraints and the presence of a large number of heritage sites in the North side, the committee settled on the South site. A site atop the Raisina Hill, formerly Raisina Village, a Meo village, was chosen for the Rashtrapati Bhawan, then known as the Viceroy's House. The reason for this choice was that the hill lay directly opposite the Dinapanah citadel, which was also considered the site of Indraprastha, the ancient region of Delhi. Subsequently, the foundation stone was shifted from the site of Delhi Durbar of 1911–1912, where the Coronation Pillar stood, and embedded in the walls of the forecourt of the Secretariat. The Rajpath, also known as King's Way, stretched from the India Gate to the Rashtrapati Bhawan. The Secretariat building, the two blocks of which flank the Rashtrapati Bhawan and house various ministries of the Government of India, and the Parliament House, both designed by Herbert Baker, are located at the Sansad Marg and run parallel to the Rajpath. In the south, land up to Safdarjung's Tomb was acquired in order to create what is today known as Lutyens' Bungalow Zone. Before construction could begin on the rocky ridge of Raisina Hill, a circular railway line around the Council House (now Parliament House), called the Imperial Delhi Railway, was built to transport construction material and workers for the next twenty years. The last stumbling block was the Agra-Delhi railway line that cut right through the site earmarked for the hexagonal All-India War Memorial (India Gate) and Kingsway (Rajpath), which was a problem because the Old Delhi Railway Station served the entire city at that time. The line was shifted to run along Yamuna river, and it began operating in 1924. The New Delhi Railway Station opened in 1926 with a single platform at Ajmeri Gate near Paharganj and was completed in time for the city's inauguration in 1931. As construction of the Viceroy's House (the present Rashtrapati Bhavan), Central Secretariat, Parliament House, and All-India War Memorial (India Gate) was winding down, the construction of a shopping district and a new plaza, Connaught Place, began in 1929, and was completed by 1933. Named after Prince Arthur, 1st Duke of Connaught (1850–1942), it was designed by Robert Tor Russell, chief architect to the Public Works Department (PWD). After the capital of India moved to Delhi, a temporary secretariat building was constructed in a few months in 1912 in North Delhi. Most of the government offices of the new capital moved here from the 'Old secretariat' in Old Delhi (the building now houses the Delhi Legislative Assembly), a decade before the new capital was inaugurated in 1931. Many employees were brought into the new capital from distant parts of India, including the Bengal Presidency and Madras Presidency. Subsequently housing for them was developed around Gole Market area in 1920s. Built in 1940s, to house government employees, with bungalows for senior officials in the nearby Lodhi Estate area, Lodhi colony near historic Lodhi Gardens, was the last residential areas built by the British Raj. Rashtrapati Bhavan and adjacent buildings, illuminated for the Republic Day. After India gained independence in 1947, a limited autonomy was conferred to New Delhi and was administered by a Chief Commissioner appointed by the Government of India. In 1956, Delhi was converted into a union territory and eventually the Chief Commissioner was replaced by a Lieutenant Governor. The Constitution (Sixty-ninth Amendment) Act, 1991 declared the Union Territory of Delhi to be formally known as National Capital Territory of Delhi. A system was introduced under which the elected Government was given wide powers, excluding law and order which remained with the Central Government. The actual enforcement of the legislation came in 1993. The first major extension of New Delhi outside of Lutyens' Delhi came in the 1950s when the Central Public Works Department (CPWD) developed a large area of land southwest of Lutyens' Delhi to create the diplomatic enclave of Chanakyapuri, where land was allotted for embassies, chanceries, high commissions and residences of ambassadors, around wide central vista, Shanti Path. With a total area of 42.7 km2 (16.5 sq mi), New Delhi forms a small part of the Delhi metropolitan area. Because the city is located on the Indo-Gangetic Plain, there is little difference in elevation across the city. New Delhi and surrounding areas were once a part of the Aravalli Range; all that is left of those mountains is the Delhi Ridge, which is also called the Lungs of Delhi. While New Delhi lies on the floodplains of the Yamuna River, it is essentially a landlocked city. East of the river is the urban area of Shahdara. New Delhi falls under the seismic zone-IV, making it vulnerable to earthquakes. New Delhi lies on several fault lines and thus experiences frequent earthquakes, most of them of mild intensity. There has, however, been a spike in the number of earthquakes in the last six years, most notable being a 4.7-magnitude earthquake on November 25, 2007, a 4.2-magnitude earthquake on September 7, 2011, a 5.2-magnitude earthquake on March 5, 2012, and a swarm of twelve earthquakes, including four of magnitudes 2.5, 2.8, 3.1, and 3.3, on November 12, 2013. The climate of New Delhi is a monsoon-influenced humid subtropical climate (Köppen Cwa) with high variation between summer and winter in terms of both temperature and rainfall. The temperature varies from 46 °C (115 °F) in summers to around 0 °C (32 °F) in winters. The area's version of a humid subtropical climate is noticeably different from many other cities with this climate classification in that it features long and very hot summers, relatively dry and cool winters, a monsoonal period, and dust storms. Summers are long, extending from early April to October, with the monsoon season occurring in the middle of the summer. Winter starts in November and peaks in January. The annual mean temperature is around 25 °C (77 °F); monthly daily mean temperatures range from approximately 09 to 34 °C (48 to 93 °F). New Delhi's highest temperature ever recorded is 49.1 °C (120.4 °F) while the lowest temperature ever recorded is −0.6 °C (31 °F). Those for Delhi metropolis stand at 49.9 °C (121.8 °F) and −2.2 °C (28 °F) respectively. The average annual rainfall is 784 millimetres (30.9 in), most of which is during the monsoons in July and August. Delhi has very poor air quality, far worse than the quality of air in Beijing, long thought to have the worst air quality for a big city. In January 2014, New Delhi’s reading of fine particulate matter (PM), taken at Punjabi Bagh, a relatively affluent area with better air quality than other areas, was 473, which was twice as high as Beijing, which had an average reading of 227. Only one day in three weeks in January, 2014, did New Delhi’s daily PM reading fall below 300, which is 12 times the figure recommended by the WHO. Even the PM 10 (particulate matter less than 10 micrometers in diameter) count in Delhi was more than two and a half times that in Beijing. Exhaust gas from poorly maintained road vehicles is one of the reasons for New Delhi's poor air quality. Many expatriates and affluent Indians have been forced to install expensive air purifiers to protect themselves against the very poor air quality. The national capital of India, New Delhi is jointly administered by both the federal Government of India and the local Government of Delhi, is also the capital of the NCT of Delhi. As of 2005, the government structure of the New Delhi Municipal Council includes a chairperson, three members of New Delhi's Legislative Assembly, two members nominated by the Chief Minister of National Capital Territory of Delhi (NCT) and five members nominated by the central government. The head of state of Delhi is the Lieutenant Governor of Union Territory of Delhi, appointed by the President of India on the advice of the Central government and the post is largely ceremonial, as the Chief Minister of Union Territory of Delhi is the head of government and is vested with most of the executive powers. According to the Indian constitution, if a law passed by Delhi's legislative assembly is repugnant to any law passed by the Parliament of India, then the law enacted by the parliament shall prevail over the law enacted by the assembly. Being a planned city, New Delhi has numerous arterial roads, some of which have an iconic status associated with them such as Rajpath, Janpath and Akbar Road. Road construction and maintenance is primarily the responsibility of New Delhi Municipal Council (NDMC)'s Civil Engineering Department. Underground subways are a common feature across New Delhi. In 1971, the administrative responsibility of the Delhi Transport Corporation (DTC) was transferred from Municipal Corporation of Delhi to Government of India following which DTC extended its operations to New Delhi. Public transport in Delhi is provided by buses, auto rickshaws and a metro rail system. Buses are the most popular means of transport catering to about 60% of the total demand. The state-owned Delhi Transport Corporation (DTC) is a major bus service provider for the city. The DTC operates the world's largest fleet of environment-friendly CNG buses. Delhi BRTS is Bus rapid transit serving the city which runs between Ambedkar Nagar and Delhi Gate. CNG powered Auto rickshaw for common public transport. The Delhi Metro, a mass rapid transit system built and operated by Delhi Metro Rail Corporation (DMRC), serves many parts of Delhi as well as the satellite cities of Gurgaon and Noida. Under an agreement with NDMC, DMRC can acquire land for the construction of metro rail and stations in New Delhi without any financial implications. NDMC is also constructing multi-level parking systems in collaboration with DMRC at various Delhi metro stations across New Delhi to increase parking space. The New Delhi Railway Station which is the main railway station in Delhi, is the second busiest and one of the largest stations in Asia, connects Delhi with the rest of the country and also Lahore in Pakistan. Delhi Monorail is the monorail system for the city of New Delhi which will be approximately 90 kilometres (56 mi). It is planned to completed by year 2017. New Delhi has a population of 249,998. The district has a population density of 5,854.7 inhabitants per square kilometre (15,164 /sq mi). The Laxminarayan Temple is a famous Hindu temple in New Delhi. Hinduism is the religion of 83.8% of New Delhi's population. There are also large communities of Muslims (6.3%), Sikhs (5.4%), Jains (1.1%) and Christians (0.9%) in Delhi. Other religious groups (2.5%) include Parsis, Buddhists and Jews. Hindi and Punjabi are the main spoken languages in New Delhi. Religious festivals include Diwali (the festival of light), Maha Shivaratri, Teej, Guru Nanak Jayanti, Baisakhi, Durga Puja, Holi, Lohri, Eid ul-Fitr, Eid ul-Adha, Christmas, Chhath Puja and Mahavir Jayanti. The Qutub Festival is a cultural event during which performances of musicians and dancers from all over India are showcased at night, with the Qutub Minar as the chosen backdrop of the event. Other events such as Kite Flying Festival, International Mango Festival and Vasant Panchami (the Spring Festival) are held every year in Delhi. The Rajpath which was built similar to the Champs-Élysées in Paris is the ceremonial boulevard for the Republic of India located in New Delhi. The annual Republic Day parade takes place here on 26 January. The 'Martyr's Column' at the Gandhi Smriti, the spot where Mahatma Gandhi was assassinated in New Delhi on 1948. In the coming years, a new National War Memorial and Museum will be constructed in New Delhi. The city hosted the 2010 Commonwealth Games and annually hosts Delhi Half Marathon foot-race. The city has previously hosted the 1951 Asian Games and the 1982 Asian Games. New Delhi was interested  in bidding for the 2019 Asian Games but was turned down by the government on 2 August 2010 amid allegations of corruption in 2010 Commonwealth Games . Tata Motors pavilion showcasing its Jaguar range at Delhi Auto Expo. The Government of National Capital Territory of Delhi does not release any economic figures specifically for New Delhi but publishes an official economic report on the whole of Delhi annually. According to the Economic Survey of Delhi, the metropolis has a net State Domestic Product (SDP) of Rs. 83,085 crores (for the year 2004–05) and a per capita income of Rs. 53,976($ 1,200). In the year 2008–09 New Delhi had a Per Capita Income of Rs.1,16,886 ($ 2,595).It grew by 16.2% to reach Rs.1,35,814 ($ 3,018) in 2009–10 fiscal. New Delhi's Per Capita GDP (at PPP) was at $ 6,860 during 2009–10 fiscal, making it one of the richest cities in India. The tertiary sector contributes 78.4% of Delhi's gross SDP followed by secondary and primary sectors with 20.2% and 1.4% contribution respectively. The city is home to numerous international organisations. The Asian and Pacific Centre for Transfer of Technology of the UNESCAP servicing the Asia-Pacific region is headquartered in New Delhi. New Delhi is home to most UN regional offices in India namely the UNDP, UNODC, UNESCO, UNICEF, WFP, UNV, UNCTAD, FAO, UNFPA, WHO, World Bank, IMF, UNIFEM, IFC and UNAIDS. New Delhi hosted the 7th NAM Summit in 1983 and 4th BRICS Summit in 2012. ^ "DELHI’s DEMOGRAPHY: Uniqueness". Ministry of Urban Development. p. 2. http://www.urbanindia.nic.in/programme/uwss/uiww/PPT_4th_Meeting/DJB_Water_PPT.pdf. Retrieved 11 April 2013. ^ "Cities having population 1 lakh and above". censusindia. The Registrar General & Census Commissioner, India. http://www.censusindia.gov.in/2011-prov-results/paper2/data_files/India2/Table_2_PR_Cities_1Lakh_and_Above.pdf. Retrieved 18 October 2011. ^ Lahiri, Tripti (13 January 2012). "New Delhi: One of History’s Best-Kept Secrets". The Wall Street Journal. http://blogs.wsj.com/indiarealtime/2011/11/08/one-of-historys-best-kept-secrets/. ^ Stancati, Margherita (8 December 2011). "New Delhi becomes the capital of Independent India". The Wall Street Journal. http://blogs.wsj.com/indiarealtime/2011/12/08/independence-through-a-womans-lens/. Retrieved 11 December 2011. ^ a b Wright, Tom (11 November 2011). "Why Delhi? The Move From Calcutta". The Wall Street Journal. http://blogs.wsj.com/indiarealtime/2011/11/11/why-delhi-the-move-from-calcutta/. Retrieved 16 November 2011. ^ Wright, Tom (22 November 2011). "In 1911, Rush to Name Delhi as Capital Causes a Crush". The Wall Street Journal. http://blogs.wsj.com/indiarealtime/2011/11/22/in-1911-rush-to-name-delhi-as-capital-causes-a-crush/. Retrieved 3 December 2011. ^ "Was New Delhi a Death Knell for Calcutta?". The Wall Street Journal. 28 November 2011. http://blogs.wsj.com/indiarealtime/2011/11/28/was-new-delhi-a-death-knell-for-calcutta/. Retrieved 3 December 2011. ^ Hall, P (2002). Cities of Tomorrow. Blackwell Publishing. pp. 198–206. ISBN 0-631-23252-4. ^ Coronation park Hindustan Times, 14 August 2008. ^ Lahiri, Tripti (20 November 2011). "The New Delhis That Might Have Been". The Wall Street Journal. http://blogs.wsj.com/indiarealtime/2011/11/20/the-new-delhis-that-might-have-been/. Retrieved 3 December 2011. ^ Patwant, Singh (2002-2003). "Sir Edwin and the building". wmf.org. http://www.wmf.org/sites/default/files/wmf_article/pg_38-43_new_delhi.pdf. Retrieved 31 December 2013. ^ "New Delhi: The Inaugural Ceremony". The Times (London) (45744): p. 12. 1931-02-11. ^ "Yadgaar". National Museum, New Delhi. http://nationalmuseumindia.gov.in/pdf/yadgaar.pdf. Retrieved 18 May 2010. ^ a b "Architecture of New Delhi". Apollo (magazine). http://www.apollo-magazine.com/news-and-comment/7412378/architecture.thtml. Retrieved 30 January 2012. ^ Chishti, M. Anees (2001). "Delhi Town Planning Committee". Committees and commissions in pre-independence India 1836–1947, Vol. 4. Mittal Publications. p. 220. ISBN 81-7099-804-2. http://books.google.co.in/books?id=O9Wck_MEB9cC&pg=PA220&dq=Paharganj&hl=en&ei=BhVzTveeNI3SrQfMv-XcCg&sa=X&oi=book_result&ct=result&resnum=9&ved=0CE0Q6AEwCDge#v=onepage&q=Paharganj&f=false. ^ "A fine balance of luxury and care". Hindustan Times. 21 July 2011. http://www.hindustantimes.com/News-Feed/chunk-ht-ui-newdelhi100years-topstories/A-fine-balance-of-luxury-and-care/Article1-723880.aspx. ^ "When Railways nearly derailed New Delhi". Hindustan Times. 18 January 2011. http://www.hindustantimes.com/News-Feed/newdelhi/When-Railways-nearly-derailed-New-Delhi/Article1-652023.aspx. ^ "CP's blueprint: Bath's Crescent". Hindustan Times. 8 February 2011. http://www.hindustantimes.com/CP-s-blueprint-Bath-s-Crescent/Article1-659739.aspx. ^ "Capital story: Managing a New Delhi". Hindustan Times. 1 September 2011. http://www.hindustantimes.com/Capital-story-Managing-a-New-Delhi/Article1-740284.aspx. ^ "A tale of two cities". Hindustan Times. 1 September 2011. http://www.hindustantimes.com/News-Feed/newdelhi/A-tale-of-two-cities/Article1-740282.aspx. ^ "The Constitution (Sixty-Ninth Amendment) Act, 1991". The Constitution (Amendment) Acts, The Constitution of India. National Informatics Centre, Ministry of Communications and Information Technology, Government of India. http://indiacode.nic.in/coiweb/amend/amend69.htm. Retrieved 8 January 2007. ^ Viswambhar Nath (2007). "Delhi Before 1947". Urbanization, urban development, and metropolitan cities in India. Concept Publishing Company. pp. 248, 251. ISBN 81-8069-412-7. http://books.google.co.in/books?id=Obd1vEVEPdgC&pg=PA244&dq=Paharganj&hl=en&ei=QJl1Ttz3HM7KrAe3krXAAw&sa=X&oi=book_result&ct=result&resnum=2&ved=0CDUQ6AEwAThG#v=onepage&q=Paharganj&f=false. ^ "NDMC Act". Ndmc.gov.in. http://www.ndmc.gov.in/AboutNDMC/NNDMCAct.aspx. Retrieved 4 November 2008. ^ "Hazard profiles of Indian districts" (PDF). National Capacity Building Project in Disaster Management. UNDP. Archived from the original on 16 May 2006. https://web.archive.org/web/20060519100611/http://www.undp.org.in/dmweb/hazardprofile.pdf. Retrieved 23 August 2006. ^ Extreme Temperatures Around The World. Retrieved 17 November 2012. ^ "Chapter 1: Introduction" (PDF). Economic Survey of Delhi, 2005–2006. Planning Department, Government of National Capital Territory of Delhi. pp. pp1–7. http://delhiplanning.nic.in/Economic%20Survey/ES%202005-06/Chpt/1.pdf. Retrieved 21 December 2006. ^ "World Weather Information Service - New Delhi". World Meteorological Organisation. http://worldweather.wmo.int/066/c00224.htm. Retrieved 4 May 2011. ^ "New Delhi Climate Normals 1971-1990". National Oceanic and Atmospheric Administration. ftp://ftp.atdd.noaa.gov/pub/GCOS/WMO-Normals/RA-II/IN/42182.TXT. Retrieved 21 December 2012. ^ "Climatological Normals of New Delhi, India". Hong Kong Observatory. http://www.weather.gov.hk/wxinfo/climat/world/eng/asia/india/new_delhi_e.htm. Retrieved 4 May 2011. ^ a b HARRIS, GARDINER (25 January 2014). "Beijing’s Bad Air Would Be Step Up for Smoggy Delhi". New York Times. http://www.nytimes.com/2014/01/26/world/asia/beijings-air-would-be-step-up-for-smoggy-delhi.html?emc=edit_tnt_20140126&tntemail0=y. Retrieved 27 January 2014. ^ a b BEARAK, MAX (February 7, 2014). "Desperate for Clean Air, Delhi Residents Experiment with Solutions". Nw York Times. http://india.blogs.nytimes.com/2014/02/07/desperate-for-clean-air-delhi-residents-experiment-with-solutions/?emc=edit_tnt_20140208&tntemail0=y. Retrieved 8 February 2014. ^ "You Think the Air in Beijing Is Bad? Try New Delhi". The New York Times. http://india.blogs.nytimes.com/2013/01/31/you-think-the-air-in-beijing-is-bad-try-new-delhi/. Retrieved 7 February 2013. ^ "New Delhi air pollution worse than Beijing's". GlobalPost. http://www.globalpost.com/dispatch/news/regions/asia-pacific/india/130131/new-delhi-air-pollution-worse-bejing. Retrieved 7 February 2013. ^ "The Constitution (Amendment)". Indiacode.nic.in. http://indiacode.nic.in/coiweb/amend/amend69.htm. Retrieved 4 November 2008. ^ "Embassies in Delhi, Embassies Address, Contacts, E-Mail, Delhi Embassies". Delhionline.in. http://www.delhionline.in/City-Guide/Embassies-in-Delhi/. Retrieved 4 November 2008. ^ "Cities". cities.expressindia.com. http://cities.expressindia.com/local-news/archivefullstory.php?newsid=237852&creation_date=2007-05-25. Retrieved 4 November 2008. ^ "VIDD – Airport". Great Circle Search. Karl L. Swartz. http://gc.kls2.com/airport/VIDD. Retrieved 14 January 2007. ^ "The Hindu : New Delhi News : Two-level parking for Palika Place". The Hindu (Chennai, India). 26 July 2007. http://www.hindu.com/2007/07/26/stories/2007072655710400.htm. Retrieved 4 November 2008. ^ "Data on Religion". Census of India 2001. p. 1. http://www.censusindia.gov.in/. Retrieved 16 May 2006. ^ "Independence Day". 123independenceday.com. Compare Infobase Limited. http://123independenceday.com/indian/gift_of/freedom/. Retrieved 4 January 2007. ^ Ray Choudhury, Ray Choudhury (28 January 2002). "R-Day parade, an anachronism?". The Hindu Business Line. http://www.thehindubusinessline.in/2002/01/28/stories/2002012800060800.htm. Retrieved 13 January 2007. ^ a b "Fairs & Festivals of Delhi". Delhi Travel. India Tourism.org. http://www.india-tourism.org/delhi-travel-info/delhi-fairs-festivals.html. Retrieved 13 January 2007. ^ Tankha, Madhur (15 December 2005). "It's Sufi and rock at Qutub Fest". The Hindu (Chennai, India). http://www.hindu.com/2005/12/15/stories/2005121503090200.htm. Retrieved 13 January 2007. ^ a b The Millennium Book on New Delhi. Oxford University Press, USA. ISBN 978-0-19-565445-5. ^ "New Delhi's controversial birth". NDTV. http://www.ndtv.com/article/india/new-delhi-s-controversial-birth-157374. Retrieved 10 March 2012. ^ a b c d "New Delhi: A New Capital". Boloji.com. 30 January 2012. http://www.boloji.com/index.cfm?md=Content&sd=Articles&ArticleID=1005. ^ "The Building of New Delhi". The Wall Street Journal. 30 January 2012. http://blogs.wsj.com/indiarealtime/2011/11/16/the-building-of-new-delhi/. ^ "History of the National Museum". http://nationalmuseumindia.gov.in/history.html. Retrieved 25 January 2011. ^ "Delhi- 100 years as the Capital". The Hindu (Chennai, India). 1 February 2011. http://www.hindu.com/yw/2011/02/01/stories/2011020150210200.htm. ^ "Complete list of Museums in city of New Delhi and Union Territory of Delhi". Government of Delhi, India. 12 January 2012. http://delhigovt.nic.in/museum.asp#15. ^ "Supreme Court of India - Museum". Supreme Court of India. 19 October 2012. http://supremecourtofindia.nic.in/supct/scm/scimuseum_publish.pdf. ^ "National War Memorial and National War Memorial Museum to come up at India Gate at New Delhi, India". The Indian Express. 19 October 2012. http://www.indianexpress.com/news/national-war-memorial-to-come-up-at-india-gate/991366. ^ "Finally, plans for National War Memorial approved: Defence Minister of India". NDTV. 19 October 2012. http://www.ndtv.com/article/india/finally-plans-for-national-war-memorial-approved-defence-minister-256172. ^ "India Reportedly Keen To Bid For 2a019 ASIAD". Yahoo! News Malaysia. Bernama. 26 June 2010. http://malaysia.news.yahoo.com/bnm/20100625/tsp-sports-asian-games-cc21d00.html. Retrieved 27 June 2010. ^ "Indian government says no to bid for 2019 Asian Games". NDTV India. 2 August 2010. Archived from the original on 5 August 2010. https://web.archive.org/web/20100805000601/http://www.ndtv.com/article/sports/government-says-no-to-bid-for-2019-asian-games-sources-41508. Retrieved 2 August 2010. ^ "New Delhi: Overall rank 37; Economic activity rank 39 by 2011 Wealth Report". Rediff Business. 21 April 2011. http://www.rediff.com/business/slide-show/slide-show-1-new-delhi-mumbai-in-top-global-cities-index/20110421.htm. Retrieved 29 June 2011. ^ "New Delhi is now among global retail hotspots". Hindustan Times. 9 May 2013. http://www.hindustantimes.com/business-news/WorldEconomy/New-Delhi-is-now-among-global-retail-hotspots/Article1-1057665.aspx. Retrieved 12 May 2013. ^ a b c "Chapter 2: State Income" (PDF). Economic Survey of Delhi, 2005–2006. Planning Department, Government of National Capital Territory of Delhi. pp. pp8–16. http://delhiplanning.nic.in/Economic%20Survey/ES%202005-06/Chpt/2.pdf. Retrieved 21 December 2006. ^ "The Asian and Pacific Centre for Transfer of Technology of the UNESCAP". Asian and Pacific Centre for Transfer of Technology, UNESCAP. http://www.apctt.org/about_us/aboutus.html. ^ "Plans for the BRICS Delhi Summit: March 29, 2012". brics.utoronto.ca. http://www.brics.utoronto.ca/plans/brics-plans-120110.pdf. Retrieved 16 January 2012. Byron, Robert. (1997). Architectural Review, New Delhi. London: Asian Educational Services; 2 edition. pp. 36 pages.. ISBN 978-8120612860. Volwahsen, Andreas. (2003). Imperial Delhi: The British Capital of the Indian Empire. Prestel Publishing. pp. 320 pages.. ISBN 978-3791327884. Pothen, Nayantara. (2012). Glittering Decades New Delhi in Love and War. Penguin. pp. 288 pages.. ISBN 978-0670086009. This page uses content from the English language Wikipedia. The original content was at New Delhi. The list of authors can be seen in the page history. As with this Familypedia wiki, the content of Wikipedia is available under the Creative Commons License.